The Brush > FiberMesh sub-palette makes the brush FiberMesh-aware. These options can be applied to any brush. The Preserve Length slider preserves the length of your fibers during styling. A value of 100 fully preserves the fiber length while a lower value allows the fivers to become longer as they’re styled. The Forward Propagation slider affects the fiber root and propagates any adjustment forwards along the fiber without affecting the tip. The Inverse Propagation slider affects the fiber tip and propagates any adjustment backwards along the fiber without affecting the root. The Stiffness slider tries to keep the fibers from breaking up in order to maintain straightness. Higher settings will be more resistant to fiber bending. The Springness slider subtly tries to bring the fiber back to its original position while maintaining stiffness. Only active when Stiffness is turned on. The Front Collision Tolerance slider helps prevent fibers from breaking through the visible SubTools during sculpting. Imagine it as a force field that surrounds the visible SubTools. The slider value defines how many screen pixels thick this force field will be. So a value of 10 would allow you to come quite close to the surface if zoomed in close to the model but will keep the fibers progressively farther away the more you zoom out. This setting is enabled by default with all the brushes. It is a global setting, which means that turning it off for one brush turns it off for all. 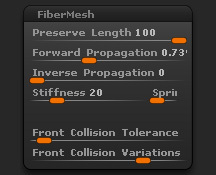 The Front Collision Variations slider will maintain a variation in the fibers when being edited to have less of an overlapping of the fibers. This will work in conjunction with the Front Collision Tolerance.